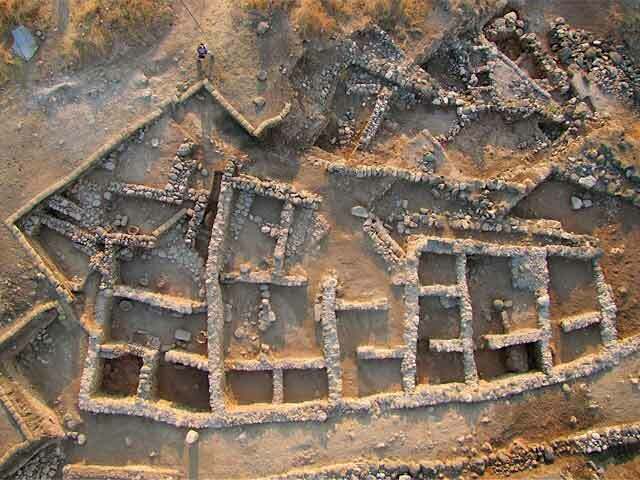 During July 2008, the Kinneret Regional Project conducted excavations at Tel Kinrot and Horbat Kur (License Nos. G-11/2008, G-45/2008, S-4/2008; Tel Kinrot map ref. NIG 250810/752848; OIG 200810/252848; H.Kur map ref. NIG 250510/754452; OIG 200510/254452). The excavations, on behalf of the Universities of Bern, Helsinki, Leiden and Mainz, were mainly sponsored by the participating universities and by several foundations, namely the UniBe Science Foundation (Bern, Switzerland), the Leiden University Funds (Leiden, The Netherlands), the Schröter-Stiftung (Neustadt, Germany) and the German Society for the Exploration of Palestine. The excavations, organized by the Kinneret Regional Project, were headed by the co-directors of the project, S. Münger, J. Pakkala and J. Zangenberg. The team members at Horbat Kur were L. Petit (co-field director; area supervision), R. Bonnie (area supervision), M. van der Enden (survey co-director; photography), G. Besuijen (registration), D. Lechner and N. Schmidt (surveying; three-dimensional modelling), SkyView Photography Ltd. (aerial photography) and P. Wyssmann (numismatics). The team members at Tel Kinrot were K. Saarelainen (area supervision), D. Vos and I. Thomsen (field assistants), I. Müller (registration), D. Lechner and N. Schmidt (surveying; three-dimensional modelling), B. Schöneweiß-Mehring (architecture), T. Tynjä (ceramic analysis), I. Gutman (pottery restoration), M. Range and C. Lennert (drawing of finds), M. Klee (paleobotany), G. Bar-Oz (paleozoology, assited by I. Thomsen), K. Maman (conservation) and W. Zwickel (project coordination and landscape archaeology). The Kinneret Regional Project wishes to thank Y. Shivtiel, U. Leibner and Y. Stepanski for their invaluable support of the work at Horbat Kur, as well as the Nature and National Parks Authority, especially A. Redvany, for maintaining the conserved architecture at Tel Kinrot. Tel Kinrot (Tell el-‘Orēme) is located on the shore of the Sea of Galilee, c. 10 km north of modern Tiberias. It has been indisputably identified with the ancient town of Kinneret, mentioned in Josh 19:35 and in Egyptian sources. The Kinneret Regional Project has conducted excavations at Tel Kinrot in 2003–2005 and 2007–2008 (Fig. 1). 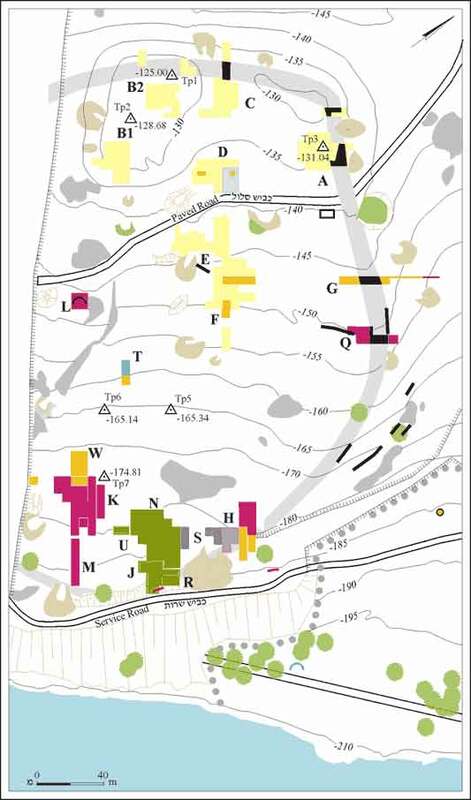 The 2008 campaign, which brought the excavations in Field I (a cluster of several excavation areas J, U, N, R and S) in the lower town to a provisional halt, focused on the Iron IB habitation strata that yielded well-preserved architecture and installations in successive layers and phases (Fig. 2). These habitation strata had initially been exposed and excavated in the 1990s under the direction of the late V. Fritz (ESI 16:33–34; 19:15*), who identified two main strata of this period, i.e., the founding stratum, labeled VI, and the main occupation stratum, labeled V. However, the recent excavations suggest that the more general term ‘Iron I horizon’ may be more appropriate, since the development of the city varied locally and no clear-cut settlement layers could be observed throughout the excavation areas. 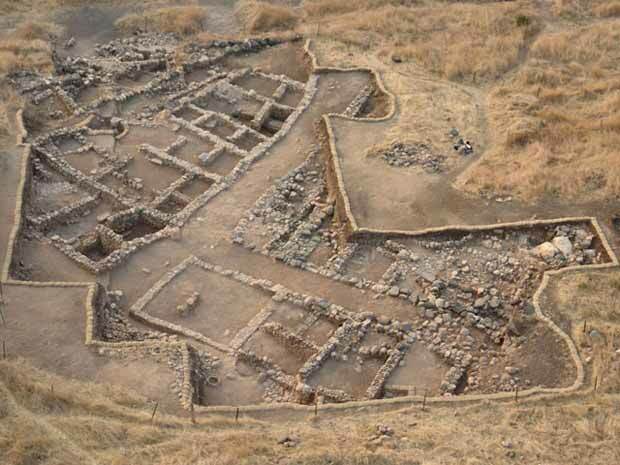 The excavations suggest that Kinneret was a major town and a regional center in the Iron IB period, especially in its later phase at the end of the eleventh and possibly the beginning of the tenth centuries BCE. Although the Iron IB city and its material culture followed the general LB urban traditions of the Southern Levant, no direct continuity with the Bronze Age remains was detected at Kinneret itself. Apparently, a new population founded the city sometime during the eleventh century BCE. It now seems likely that Kinneret was destroyed in an earthquake during the first half of the tenth century bce. Similar destructions have been observed in contemporary early Iron Age settlement layers, such as Megiddo VIA or Dan IVB. The main objective of the 2008 season was to expose the remaining northernmost part of a large domestic complex (Area S), excavated since the 1990s. The trapezoidal complex (length c. 30 m; Fig. 3) that extended along a fairly broad road, may be considered one of the most remarkable Iron I structures in the Southern Levant. It contained several separate units that were possibly intended for different activities. Contrary to most other major domestic buildings of this period, this complex was well planned from the outset and did not show slow and gradual development. Solid lateral walls served both as internal terrace walls, necessary for the effective use of the sloping terrain and as dividers of the complex into smaller compartments. Several installations, such as benches, podia and troughs, as well as well-preserved material remains that included many small finds and a large, varied pottery assemblage,were found in the rooms. A unit with several grinding tools and ovens in the northern part of the building indicated that this part of the complex was used for food preparation. Paleobotanical analyses showed that cereals were stored in one of the subterranean rooms of this complex. The current excavations uncovered three overlaying settlement layers, each divided into various sub-phases, north of the main Iron I building complex. Preliminary analysis of the stratigraphy suggested that these layers postdated the main Iron IB horizon. The architecture of the newly founded phases showed a different construction technique and poorly built dwellings that could represent later attempts to resettle the Stratum V city immediately after its destruction. The previous excavations had detected similar remains that postdated the main Iron IB horizon in other parts of the lower town, which at the time were defined as post-destruction squatter habitation. However, the discoveries in Area S indicate that the post-destruction habitation consisted of three layers and several phases, which seem to have been more substantial than simply squatter occupation. This conclusion is supported by the remains of a series of partly plastered floors with in situ pottery, which were associated with the newly discovered habitation layers. Finds. Although alterations in architecture, city layout and building quality of the post-destruction phases, in comparison with the main Early Iron Age phase, were considerable, no significant changes could be discerned in the ceramic repertoire, which consisted of some small finds and notable amounts of restorable pottery vessels, including a chalice (Fig. 4:1) and jugs (Fig. 4:2, 3) from the last pre-destruction phase and flasks (Fig. 4:4–7) and a lamp (Fig. 4:8) from the post-destruction horizon. The assemblage corresponded to pottery types of the main Early Iron Age horizon and thus represented the very late phases of Iron IB. Further analysis of the pottery will clarify whether it had any connection to early Iron IIA pottery types. 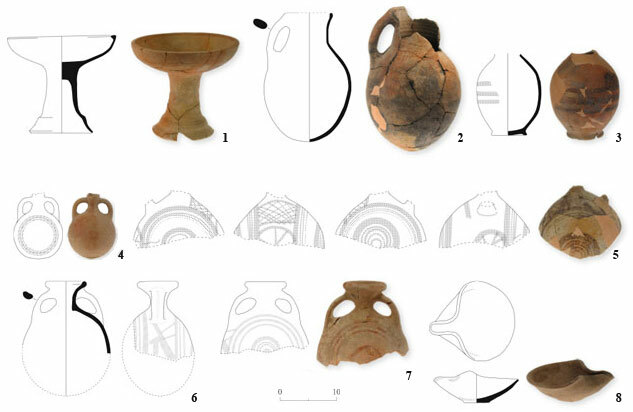 The pottery of the main Iron IB phase was basically very similar to ceramic assemblages uncovered at Tel Hadar IV, Hazor XII/XI, Dan IVB or Yoqneam XVII. It should be noted, however, that the Iron IB habitation of Kinneret may have begun slightly earlier than the well-known Megiddo VIA horizon, because typical types of Megiddo VIB and Bet She’an Lower VI were found within the main Early Iron horizon at Kinneret, as can be seen in the decorated storage jars (Fig. 5) or the occasional potsherds of classical ‘Philistine’ ceramics. Complementary Studies. A re-examination of old data enabled the extrapolation of a number of buildings from the initial Iron I city (former Stratum VI). 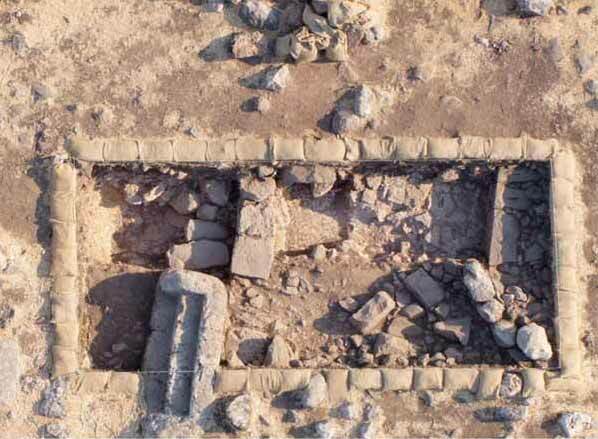 Similar to the buildings from the main Iron I horizon, these earlier structures were equally monumental in size and corroborated the assumption that Early Iron Kinneret was well-planned and structured from its commencement. The utilization of photogrammetric three-dimensional modeling, using aerial photographs and highly precise GPS-data, enabled the visualization of the architecture in Field I (Fig. 6). These technologies represent a further step toward the comprehensive digital recording of Early Iron material culture at Tel Kinrot. The 2008 excavation season has shown that the post-destruction habitation layers were significant and the pottery associated with them represented the very last phases of Iron IB or the very beginning of Iron IIA. Horbat Kur. The Kinneret Regional Project expanded its activities in this season, geographically and chronologically. Initial fieldwork at the site of Horbat Kur (Fig. 7) was intended to pave the ground for a larger research project in the coming years, aiming to better understand the rural settlement of Horbat Kur and its interaction with the changing surrounding landscape and to gain deeper appreciation of the cultural history of rural Hellenistic through Byzantine Galilee. 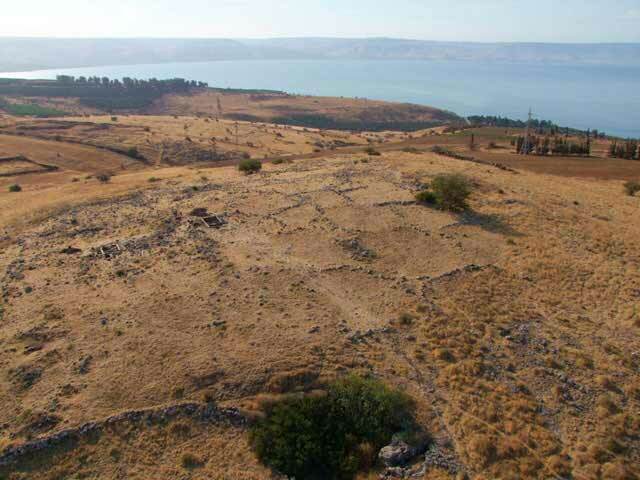 Horbat Kur is a c. 12 dunam large hilltop site, c. 2 km west of the Sea of Galilee. Its surface is littered with numerous stone walls, water installations, olive presses and other features. While the site has occasionally been discussed in earlier literature, it has never been systematically surveyed or excavated. After the clearance of the site by local workmen, all visible topographic and architectural features were mapped and a regular grid was set-up across the entire site. Two probe trenches (Areas A, B) were excavated to determine the nature of the visible ruins and to clarify the chronological range of the settlement. Area A. The trench (3 × 6 m; Fig. 8) was opened on the hill’s summit where numerous larger areas delineated by visible stone walls were detected, as well as nicely carved limestone pillars and stone steps. Some of these features had been mentioned in older reports. The hilltop location and the outline of walls suggested that Area A was situated in the public section of the site, yet it was not possible to confirm the earlier assumption that a synagogue had existed at this location. The settlement sequence in Area A dated from the Early Roman well into the Early Islamic periods, with interim gaps. 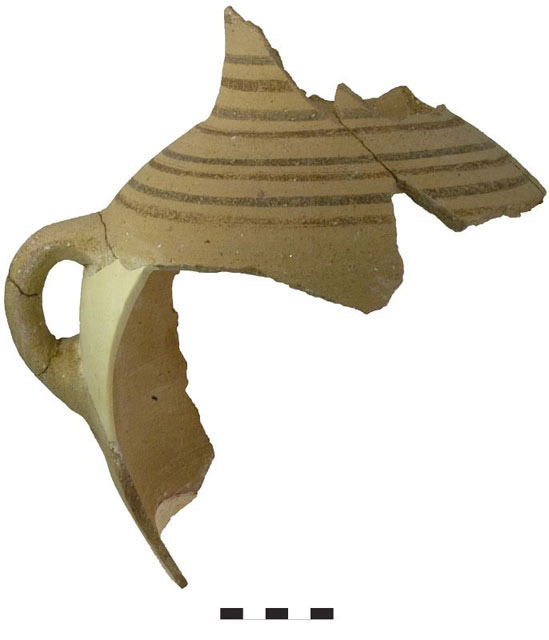 Scattered medieval potsherds suggest later habitation, although so far, no architectural remains were found to be associated with these late finds. Area B. The second trench, of equal dimensions, was opened on the northern slope of a building terrace, c. 5 m below Area A. A cistern opening and a large north–south wall that probably belonged to a courtyard, invited further investigation. Architectural remains visible in the vicinity suggested that Area B was located in the domestic section of the site, thus supplementing the data expected in Area A and creating a diversified picture of the site. It is presumed that settlement activities in Area B may have begun in the Early Roman period. The Coins. The coins recovered from Areas A and B were often in a poor state of preservation. A heavily corroded example (Fig. 9) was a surface find in 2007 and should, on the basis of the faint iconographic features still visible, be attributed to a Roman emperor, Antoninus Pius (138–161 CE). 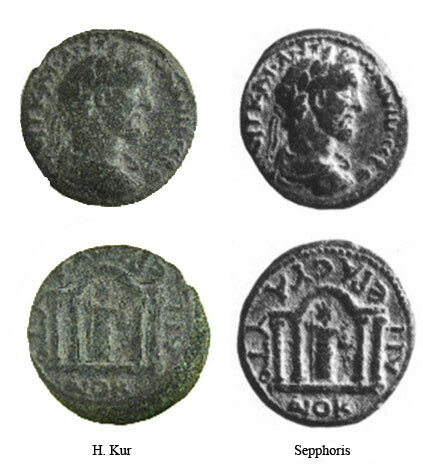 This coin has a fine comparison from Sepphoris (Y. Meshorer, City Coins of Eretz-Israel and the Decapolis in the Roman Period, Jerusalem 1985: No. 91). Survey in the vicinity of Horbat Kur. An intensive surface survey of selected areas in a 1 km perimeter around the site was undertaken. Surface examination was often seriously hampered by the high growing and dense vegetation, so that work mainly concentrated on ploughed fields and rocky areas that afforded better visibility. The survey was carried out in five sectors and provided valuable insight into local infrastructure and the use of the landscape around Horbat Kur. Many rock-cut installations, such as cisterns, channels and various tombs were documented and mapped in the course of the survey. Agricultural installations were also noted, for example a winepress (Fig. 10), next to which some potsherds from the Roman–Byzantine periods were found. 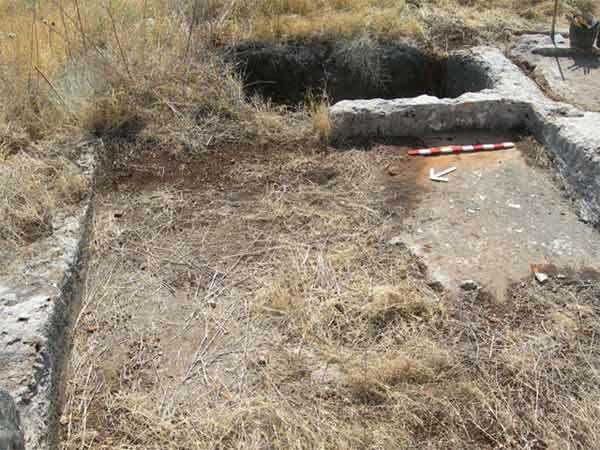 The pioneer season at Horbat Kur has demonstrated the high archaeological potential of the site and its vicinity, thus making further systematic work more beneficial. 1. Tel Kinrot, map of excavation areas. 2. Tel Kinrot, aerial view of Field I at end of 2007 Season, looking southeast. 3. Tel Kinrot, aerial view of dwelling complex in Area S, looking south. 4. Tel Kinrot, selected pottery from Area S.
5. Tel Kinrot, a decorated storage jar from Area W.
6. 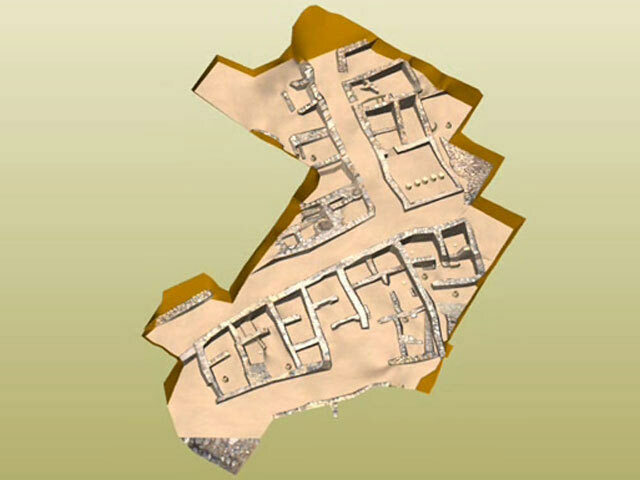 Tel Kinrot, photogrammetric three-dimensional modeling of Field I. 7. Horbat Kur, aerial view at end of 2008 Season, looking east. 8. Horbat Kur, aerial view of Area A.